John begins his summary of the true gospel by saying God is the source of and all life, salvation and holiness. Therefore those who are trust Him will have lives marked by a concern for goodness and a pursuit of righteousness. When John wrote this letter from Ephesus, he was an old man and the last surviving apostle. The generation that lived during Jesus’ earthly ministry is passing away and the next generation is no longer learning the gospel from an apostle or someone sent directly by an apostle. False teachers and distorted gospels are cropping up in the young church. John steps in to settle the debate. In 1 John 1:1-4, he argues that as an apostle he is in unique position to settle the debate because he was an eye-witness to the life and teaching of Jesus. 1 John 1:5 begins the body of the letter. 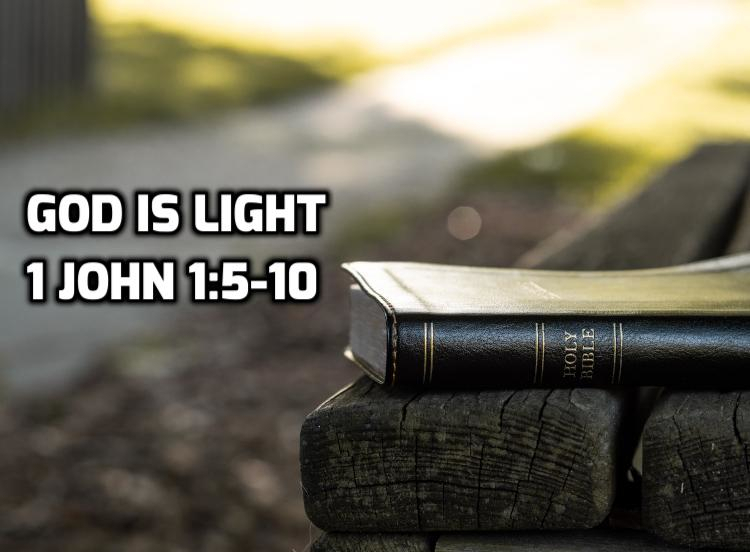 In order to recognize the true gospel, the first thing you need to know is that God is light and in Him there is no darkness. Light is a metaphor for Life/salvation, truth and goodness. See John 8:12; Psalm 27:1; Psalm 36:9; Isaiah 49:6; Psalm 119:104-105; Proverbs 6:23; John 3:16-21; Ephesians 5:7-11. God is the source of and all holiness, righteousness, goodness and truth. Those who are in trust Him will have lives marked by a concern for goodness and a pursuit of righteousness. Walking is a metaphor for the overall tone, direction and character of your life. The choices you make reveal what you really believe to be true. John may have Gnostic teaching in mind. While wide-spread cultural Gnosticism came after this letter, the ideas may have been taking root when this letter was written. One part of Gnostic teaching was that if your soul was enlightened by the right knowledge, you could do whatever you wanted with your physical body. John is NOT talking about moment by moment experience in this section. Rather he’s talking about the overall character of your life. John is contrasting repentant sinners with people who claim to follow Jesus but are unwilling to admit that they need to change their sinful lifestyle or that sin is a problem. God will forgive me and make me righteous because of the blood of Jesus Christ. 1:5 What Jesus said in His teaching that is relevant to the point at hand is that God is completely, totally and utterly good. There is no aspect of His being that is the least bit compromised by evil. 6If we claim to believe God’s message as revealed by Jesus’ teaching and yet our lifestyle is characterized by evil, we are lying about knowing believing God and do not live in accordance with what is true. 7If our lifestyle is characterized by striving after goodness, we share the same understanding of the gospel as God and Jesus, and Jesus’ death on the cross pays the debt for our sins 8If we deny that we are inherently sinful, we do not understand reality and do not know the truth. 9If we acknowledge our inherent sinfulness, Jesus is a trustworthy and just advocate on our behalf such that he forgives the debt incurred by our sins and removes the guilt of our unrighteousness. 10If we deny that our actions are evil, we contradict the teaching of Jesus and show that we do not understand his message.